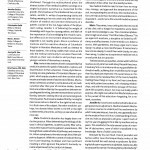 I always enjoy reading the Opinion section of JAMA where physicians and medical students can address their concerns. The section is subtitled, “A Piece of My Mind.” Here anything goes, almost. Often the comments are concerning quality of patient care and also medical care that addresses the whole person — body, soul and spirit. In the December 25, 2013 issue there is a very interesting article entitled “Five Voices, One Story.” The five voices are five medical students. Three are from medicals schools New York, one is from Tennessee, and one from Houston. The Corresponding author, Jennifer Adaeze Anyaegbunam, says, “In the frenzied effort to teach medical students the vast quantity of science behind practice, the moral and personal development of the physician can be over-shadowed.” That is an interesting observation since almost everyone would agree as to the importance of moral and personal development of those who will serve in the field of healthcare. Download, print and read the two-page article below to learn why I am proud of these five medical students who will soon be physicians. I sent an email to compliment one of the students, Mark J. Kissler, who is attending Baylor College of Medicine here in Houston. I am planning to take him out to lunch. I want to know this future physician who can shares so clearly his understanding of why it is important to actually get to know his patient. Perhaps you too could try to contact one of the other five students and compliment them, as well. The article can be found at JAMA.com: look for Dec 25, 2013, Vol. 310, No. 24, pages 2615-2616.